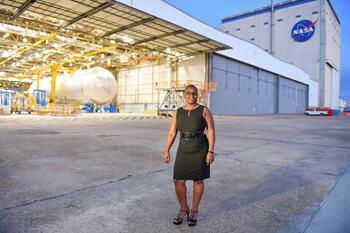 Renee Horton (2002 BACH ENGR), lead metallic/weld engineer for the Space Launch System (SLS) at the NASA Michoud Assembly Facility in New Orleans, is assigned to a special rocket that will one day take humans into deep space to explore places like Mars. As lead, Horton works with the materials review board to oversee anything metallic on the rocket or dealing with the weld. This rocket is the largest, most powerful rocket that NASA has ever built, but for Horton, it’s less about individual milestones and more about the historical significance. “Almost every single thing we’re doing is the first of its kind,” Horton said. “Every single day I walk into the factory, I realize I’m putting my footprints in history,” she said. In her five years at NASA, Horton has been awarded six group achievement awards. After earning her electrical engineering degree at LSU, she became the first African-American to earn a Ph.D. in materials science with a concentration in physics from the University of Alabama, graduating in 2011. But success did not come easily. Behind her career is a story of personal trials, triumph, and determination. From an early age, she dreamed of being an astronaut. She enrolled in LSU Air Force ROTC when she was seventeen years old and during her initial physical and screening discovered she had a hearing impairment. She could not continue, and her dreams of becoming a pilot – and eventually an astronaut – were dashed. Horton dropped out of school and decided to focus on having a family. She had two boys, born two years apart. With her third child, a girl, things began to change. “I remember holding her and thinking, ‘I need to change the world for her,’” Horton recalls. With a renewed sense of purpose, Horton decided to return to school to pursue a degree. She visited the LSU Speech, Language, Hearing Clinic and underwent a specialized test that precisely identified her hearing loss. She could hear at very low and very high frequencies but not well in the speech range. “The people at the hearing center really changed how I saw myself and what I could do with the proper accommodations,” Horton said. With a better understanding of her disability, Horton re-enrolled at LSU, this time majoring in electrical engineering with a minor in math. My love for STEM was always there, but after I accepted my disability – owned my disability, took responsibility for it, and made it mine – I realized that I could actually pursue STEM and since then I’ve just been on a path upward,” she said. Horton attended school year-round and finished her bachelor’s degree in two years. Since graduating and earning her Ph.D., she has spent her free time serving as a motivational speaker, mentor, and role model for young adults.